Join UProjects for a day of outdoor rock climbing with an opportunity to try an exciting abseil at a great venue in the Peak District. Suitable for beginners and anyone who has climbed indoors and would like to experience climbing outdoors on rock. 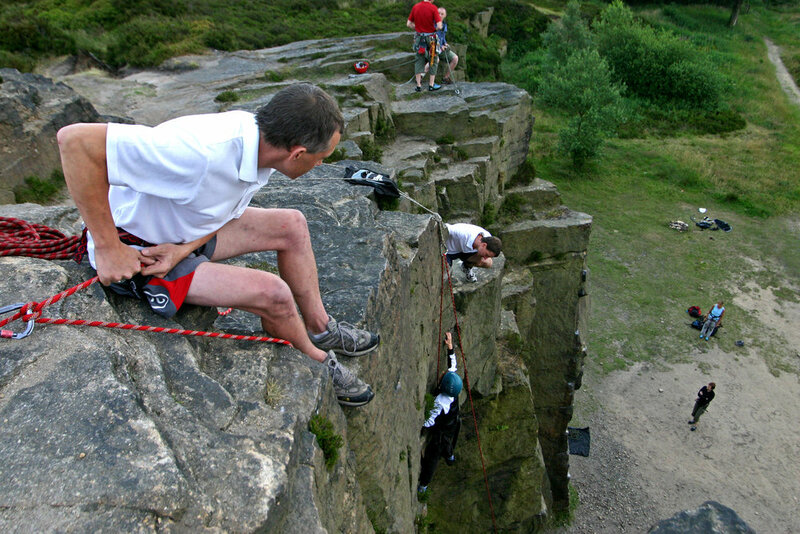 Hobson Moor quarry is located in a pleasant spot with easy access, joining instructions and more info will be sent to participants before the day. UProjects qualified team of instructors will set up the ropes on suitable climbing routes and show you the correct and safe use of climbing equipment. There will be an opportunity to climb several different routes and try an abseil, UProjects qualified climbing instructors will be supervising at all times to ensure you have a safe and exciting climbing session. Aged under 18's must be with accompanying parent. We will provide all equipment for the session but you will need to wear suitable clothing for the weather and the climbing session. Couples and groups welcome, children are welcome with parents. Building confidence, trust and responsibility are some of the benefits young people will achieve. Also a great way to build your team spirit or partnerships.